speaker cabinet and connect it to the + and - terminals. the Batpure’s terminals, not to damage the driver film by heat. No.1; Application to audio speaker No.2； Application to TV. system which has good sound. and the depth of sound is improved. Note 2; The back of TV must be opened to connect the BATPURE to a speaker. So, we have a new proposal - The method of attaching BATPURE without remodeling the TV is here. 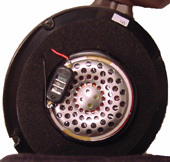 Left photo is an open-type dynamic headphone. 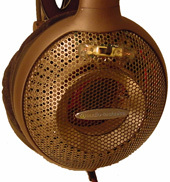 the dynamic-unit of headphone in parallel. Right photo is external of headphone. The slide switch is put on to test ON-OFF.of effect. will be shaken naturally regardless of the kind of music. Note 3; Of course, the switch need not be turned on if you don't want to make the conparison test. change into the litening accessory that you cannot parted with if the remodeling goes well. the great sound quality improvement result too. The real presence become double when adding it to 5.1CH surround speakers.